On the first day of odd-even policy implementation on Jl. Benyamin Suaeb, Pademangan, North Jakarta, Wednesday (8/1), 106 cars were ticketed due to violation.
" Total 106 cars were ticketed due to violation. 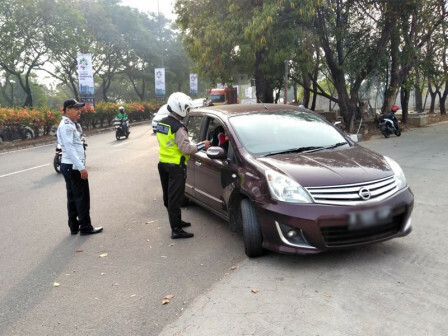 While 100 other cars were given warning"
North Jakarta Transportation Sub-dept. (Sudinhub) Head, Benhard Hutajulu stated, 50 personnel were deployed to control the traffic. "Total 106 cars were ticketed due to violation. While 100 other cars were given warning," he informed, Wednesday (8/1). From total 106 cars netted between 6AM-2PM, he explained, personnel he ld driving licenses (SIM) from 41 cars and vehicle documents (STNK) from 65 cars. His side will control odd-even policy implementation until Asian Games 2018 event ended. "We expect road users could understand, comply with the applicable rules and not commit violation," he conveyed.